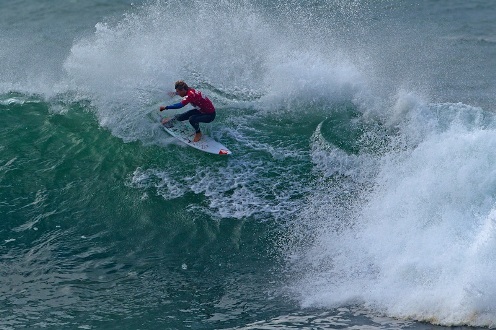 With only a slight drop in swell from Saturday, the Billabong Pro Junior Finals went down in dramatic fashion in large surf at Vic Bay as the 4-day event culminated late on Sunday afternoon. After yesterday’s cancellation of competition due to massive waves, it was more than fitting that the final day went off in solid 6-8 foot surf with some very committed and valiant surfers taking on the biggest and best that Vic Bay had to throw at them. First up this morning were the Pro Junior Girls who had been waiting patiently for the past 3 day’s for their chance to surf. And after 3 days of waiting, the girls paddled straight into some of the biggest sets of the day with some getting washed in, while the fortunate few scratched out the back. The four who managed to fight their way through the draw and into the final were Emma Smith (J-Bay), Nicole Pallet (Durban), Heidi Palmboom (Bluff) and Bianca Buitendag (Vic Bay). After an initial slow start, Bianca set the tone for the final with a succession of fluid backhand snaps and despite gallant attempts to match the score by Nicole, Heidi and Emma, Bianca was in a class of her own at a wave she knows so well and powered convincingly through to take the win, and in so doing earning herself R2 500 prize-money and 1 000 valuable PST ratings. Anyone who witnessed the U12 heats en route to the final will testify to some of the bravest and courageous surfing ever seen in a junior event. In front of many anxious parents and onlookers, the plucky U12’s took to the heavy seas in search of some of the biggest waves they had ridden in their fledging competitive careers. In between some of the ‘groms’ taking 8ft closeout waves on the head and enduring countless hold down’s, some sensational waves were ridden at least 3 times overhead for the young chargers. In the end, it was the spirited Adin Masencamp from Strand in Cape Town who took the impressive win over Ethan Fletcher (Cape Town), Jose Faulkner (J-Bay) and Jake Elkington (Cape Town) who placed 2nd, 3rd and 4th respectively. Next up were the U14 Boy’s who must also be commended for braving the gnarly conditions. In a hotly contested final with positions constantly changing, in the end it was Matt McGillivray from P.E who stole the show with a late minute score to pip Steffen Burrows (Strand) into second. Event standout Jordy Maree (Cape Town) took 3rd while a physically drained Adin Masencamp, having surfed in consecutive finals, taking 4th. With some very mature and calculated surfing displayed by all the finalists, it’s safe to say that South African junior surfing has some exciting future talents to look out for. The U16 Boys division then raised the bar even higher. With a packed Vic Bay boardwalk, the U16 finalists put on a show that many will never forget, and what some, including legendary surf coach Graham Hynes, are calling the finest final they’ve watched in years. Ultimately it was two of South Africa’s brightest surfing talents going blow for blow in the still ‘sizey’ and consistent conditions. J-Bay’s Dylan Lightfoot picked off the bombs and racked up a 9 and a high 8 point score. KZN South Coaster Slade Prestwich answered right back with a succession of stylish hack’s including one massive roundhouse rail grab carve that looked remarkably similar to those consistently pulled off by Dane Reynolds. Lightfoot, having then taken the lead back again watched in angst as Slade smashed his way to his highest wave score of the day with a 9 point ride courtesy of an under-the-lip 360 rail spin. However, it was just less than the 9.4 score he needed and Dylan secured a memorable victory, much to the delight of the cheering crowd. With the ocean beginning to settle and rippable conditions prevailing, it came time for the much anticipated finale of the Premier Pro Junior Boy’s division. Umhlanga’s Beyrick De Vries, still fresh off the plane from France was up against rival Nick Godfrey, who had managed to take down St Francis Bay compatriot Dale Staples in their semifinal match-up. With both surfers being event-standout’s it was always expected to be a nail bitter, and after the first exchange of rides, it looked to be heading that way. However, Beyrick sat slightly wider and lucked into 2 set waves that he milked all the way to the beach and despite the KZN surfer having to endure 2 consecutive ‘run-arounds’ back into the line-up, Godfrey simply wasn’t able to find the mid 7 point score he so badly needed. And with that, the final buzzer sounded, the crowd erupted and elated top seed Beyrick De Vries was crowned the Billabong Pro Junior Vic Bay Champion for 2011. Having consistently posted huge scores all weekend, charging the heavy surf and wowing the judges with his progressive no holds barred approach, it was a truly deserved win for the quirky 19 year old. Along with the prestigious internationally rated ASP Grade-One win, Beyrick walked away with a $2000 US Dollars in prize-money and 250 ASP ratings points along with a SONY Trick Docking Station which was presented to every finalist across all five divisions. 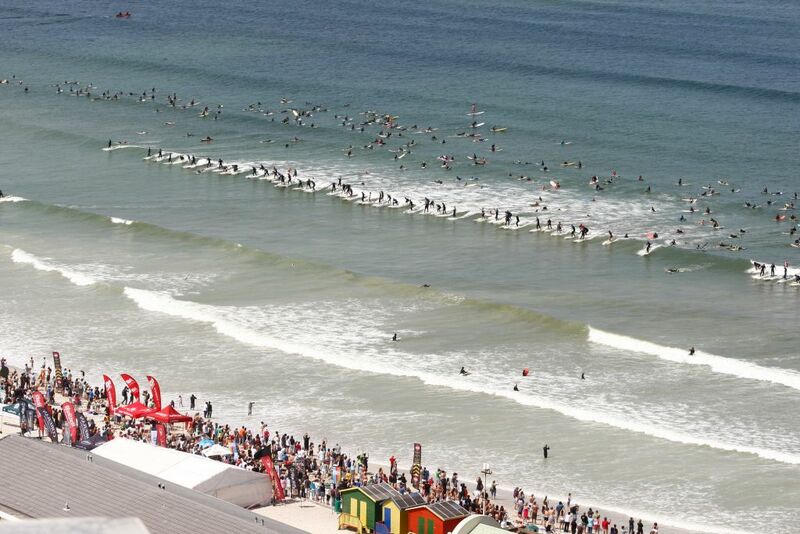 The internationally rated Pro Junior men’s event is sanctioned by ASP Africa, the regional office for ASP International, while the Pro Surf Tour (PST) women’s and boy’s events are sanctioned by Surfing South Africa (SSA), the national controlling body for the sport.